Online Shopping For Large Monarch Wheat Adult Funeral Urn for Human Ashes UK. » Big urn for adult ashes made with brass. The Monarch Wheat Adult Urn gives a beautiful art deco appearance with a classical feel to save the memories. Its shape is inspired by the funerary pots used in Egypt and Ancient Greece. 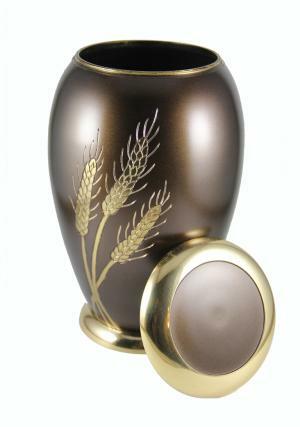 The cremation adult urn is hand cast from high quality polished brass, finished with combination of brushed brown brass and polished brass to store funeral ashes. 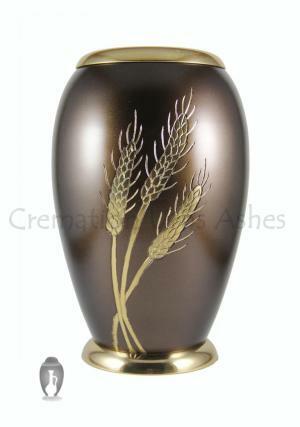 The gleaming gold colour of the wheat design gives wonderful look to the memorial urn - nicely offsetting the deep, warm brown on the middle of the item. The polished lid fits onto the body of the brass urn using a reliable screw thread, ensuring that the cremation contents are properly protected and restrained during transit and storage. Please note that we also provide a Monarch Wheat Keepsake Urn - a much smaller piece designed to take a small portion of ashes as a personal memorial. 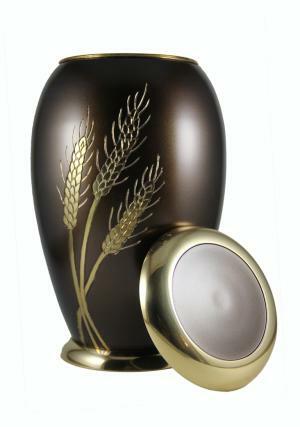 The practice of using symbols on funerary like wheat symbol on cremation urn is a historic one. 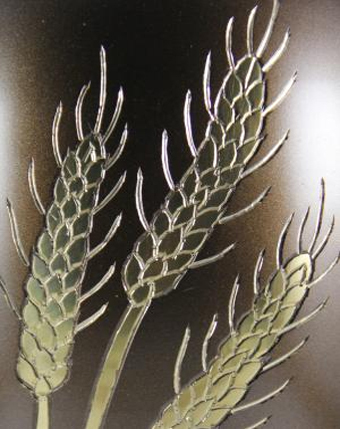 Wheat symbolises the natural progression of life, from seed through to full maturity. Wheat may also be sown, to create new life and sustenance – and so symbolises the progression of wisdom and beauty through the family. Our customer services team is more happy to help with your choice, and can offer advice on the right urn for every memorial requirement. Our phone number is 020 8004 6667, and our email address is cs@cremationurnsashes.com.